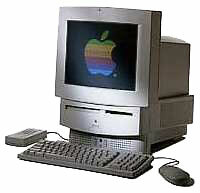 As of September 1999, I am a Junior in High School, and I've been using Apple's since 1989, when I was in first grade. We had a bunch of Apple IIgs computers all around my elementary school, and we used them pretty much for playing Oregon Trail. Until sixth grade, when I went into Middle School, those were the computers I used. In middle school we had a bunch of original LCs with 4 MB of memory and 80 MB hard drives in our computer labs. Compared to the IIgs, they were pretty spiffy! Of course the teachers had better computers - our favorites were the Power Mac 5200 series computers. While I was in sixth grade, my dad told me that his office had 2 extra laptops, and I of course jumped at the chance of having my own. That day, he brought home a PowerBook 160. I was in heaven! I amazed my little cousins with its Text-To-Speech capabilities. A week later, my dad brought a freaking 40 MHz 486 home. Now back then, I didn't know much about computers, so I said to myself, "Hmmm, 25 MHz or 40 MHz?" So I decided to use the Wintel for a while. This dumb computer had Windoze 3.0 on it and 8 MB of memory, but it kept crashing. The dumb black and white monitor was also inverted---black was white and white was black. A week after I had the Wintel, I gave it back to my dad. I used the wonderful PowerBook for two great years, until my dad decided to buy a "family" laptop. There was a choice this time, too--A PowerBook 5300ce for around $5,000 and 117 MHz, or a Gateway 2000 Solo at 133 MHz and about $3,000. I would have gotten the PowerBook, but my dad needed a Wintel for work, so I was forced to cope with it. This is when I did the stupidest thing of my life - I sold my PowerBook! I am still sorry I sold it to this day. I did, however get $700 dollars for it in 1997, so that's not too bad. I was now completely surrounded by Wintels. Nobody had a Mac except a couple of my friends. So guess where I went whenever I could. You guessed it, to my friends house. I was so sick of our stupid Wintel freezing and complaining about all this stuff, I couldn't take it any more. Last year, when the iMac was released, I was on a mission to get one as fast as I could. I couldn't stand Wintels anymore. I was even emulating the Mac OS with Fusion on my PC. It took a PII-450 all the way down (or up, probably) to a 71 MHz 68040. I finally got my iMac in February and I will never buy a Wintel again! I suggest the same to you.